In addition to hearty traditional French food, the country also has a long history of making tasty desserts such as crème brulée. Paris, France is a city known for romance. You don’t get a nickname like the “City of Love” without being an incredibly romantic destination. Paris offers breathtaking views, stunning architecture, fine art, a rich history, and, of course, fine dining. It’s no wonder why so many honeymooners choose Paris for their romantic post-nuptial getaway. And don’t forget that French is a romance language, but for this post, we are focused on one thing and one thing only – the food. Just like in our blog “Traditional German Food to Try on Your Big Trip,” we are going to take a look at some of the most iconic food France has to offer – food that you would be crazy not to try while in the country. France is full of fertile soil and, thus, a wide variety of fruits, vegetables, herbs, and grains, providing the ingredient’s for the country’s famous cuisines. So what better way to explore French culture than by taking a tour of traditional French foods? There is something for everyone. Traditional French foods range from delicious cheeses to rich desserts and everything in between – hearty soups and stews, fresh fish, and, of course, the dishes below. The French soil is also very suitable for growing grapes, which is just one reason why the country is world-renowned for its fine wines. The baguette is a long, thin loaf of bread and it is arguably the most important part of any French meal. No French meal is complete without it. The baguette can be eaten as an appetizer, it can be used to make the perfect French sandwich, or it can be placed on long-handled forks and dipped into la fondue. Originating from Nice, Ratatouille consists of tomatoes, garlic, onions, zucchini, eggplant, carrots, bell peppers, basil, marjoram, thyme and other green herbs. Ratatouille can be eaten as a main course or a side dish. In Brittany – northwestern France – the crepe reigns supreme. These thin pancakes are filled with both sweet and savory fillings. The most traditional of all French appetizers is escargots – Specially bred land snails cooked with garlic, parsley, wine sauce, and butter. Try eating escargots with a fine white wine. In addition to hearty traditional French foods, the country also has a long history of making tasty desserts such as crème brulée. 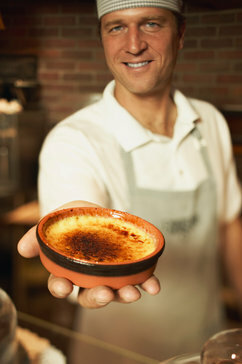 Literally meaning “burnt cream,” crème brulee consists of plain vanilla custard topped with sugar, which is then caramelized using a blow torch. Not to be confused with macaroons, which are filled with coconut, the French macaron consists of buttercream or ganache filling pressed between two meringue disks. It is the perfect combination of crunch and cream. If you have any questions about French Food or want help booking your next adventure, please contact AESU by calling 800-638-7640 or fill out the contact form found on our website. This entry was posted on Thursday, July 23rd, 2015	at 4:35 pm	. You can follow any responses to this entry through the RSS 2.0	feed. Both comments and pings are currently closed.